Sun., Oct. 5, 2014, 4:52 p.m. 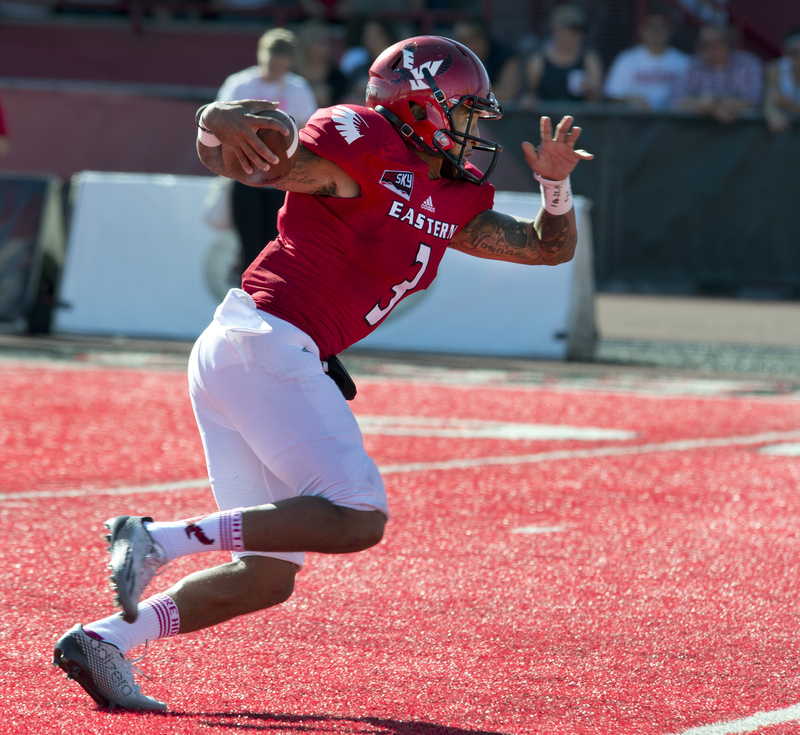 If the Eastern Washington football team makes another deep run into the postseason, it will have to make part of the journey without quarterback Vernon Adams Jr.
Adams will miss three to six weeks of action after breaking two bones in his right foot Saturday during the Eagles’ win over Idaho State, coach Beau Baldwin said Sunday. In comments following Eastern’s 56-53 win at Roos Field, Adams told reporters that he rolled his ankle during the first half. But he played through the injury, completing 23 of 35 passes for 354 yards and four touchdowns. Adams, considered the front-runner for the Walter Payton Award – the Football Championship Subdivision equivalent of the Heisman Trophy – also rushed for 79 yards and two more scores against ISU. He had several carries in the second half, while limping onto and off the field between offensive series. X-rays later revealed breaks in two metatarsal bones. “That says more to me than anything else that he’s done in his career up to this point,” said Baldwin, who is expected to start redshirt sophomore Jordan West when the second-ranked Eagles (5-1 overall, 2-0 in the Big Sky Conference) visit Southern Utah on Saturday. West, from Maple Valley, Washington, has seen spot duty this season in games against Montana Western and UC Davis. He has completed 7 of 11 passes for 62 yards and one touchdown. The 6-foot-4, 220-pound West redshirted in 2012 and did not see action in 2013. Saturday’s game in Cedar City, Utah, will mark the Eagles’ return to the scene of their last Big Sky defeat, 30-27, on Oct. 27, 2012. Since then, Eastern has won 12 straight conference games. Southern Utah is 1-5 overall and 1-1 in the Big Sky following a 42-39 loss Saturday at Cal Poly. Against Idaho State, Adams accounted for six touchdowns, and in the process went over the 10,000-yard mark for total offense in his career. He now has 17 performances in his 33-game career with at least 300 yards passing. Adams already has 2,157 yards passing and 24 touchdowns in six games, having completed 68 percent of his 231 passes with four interceptions. He leads FCS in per-game rankings for total offense (394.3 yards), passing offense (359.5 yards) and points responsible for (27.3), as well as for TD passes (24). He is currently third in passing efficiency rating (176.8). More important, Adams is 25-5 as a starter at Eastern and ranks No. 1 in Big Sky and EWU history with a 176.4 career passing efficiency rating. He ranks just behind San Diego’s Josh Johnson (176.7 from 2004-07) for the FCS record, and is just ahead of former Eagle and FCS record-holder Erik Meyer (166.5 from 2002-05) for the Big Sky and EWU records. With a school-record seven TD tosses at Washington on Sept. 6 and eight more since then, Adams has 99 touchdown passes in his career, ranking 14th all-time in FCS history. Published: Oct. 5, 2014, 4:52 p.m.